Your child’s journey to hearing will undoubtedly be full of cherished moments. The initial activation will be scheduled two to four weeks after the implantation. It may feel like an eternity between the two dates, but this gives your child time to heal as your family prepares for a new beginning. The audiologist will use special software to create a customized set of programs for your child’s sound processor. It’s during this process that your child should begin to be able to hear sound. Some children will be able to tell the audiologist what they hear as well as the loudness and pitch of sound. 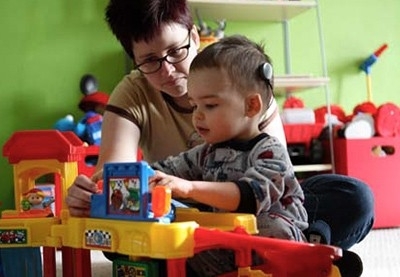 If your child is unable to communicate what they hear, do not worry! Your audiologist is specially trained to observe your child’s behavioral responses to sound. Additionally, AB’s software provides your audiologist with a tool to measure the hearing nerve’s responses to sound so that the appropriate levels can be set for the hearing program regardless of your child’s ability to participate in the programming. In addition to devising a rehabilitation plan with your child’s audiologist, you can also utilize The Listening RoomTM, an interactive website for parents and professionals that provides free ideas, materials and support in English to promote active listening and language skills. Your child’s audiologist will guide you in scheduling the next programming sessions. Typically, multiple mapping sessions are needed through the first few months of your child’s journey. Your observations of your child’s responses will help the audiologist make adjustments, evaluate your child’s progress, and optimize your child’s hearing.